OUR PRICE: $38.25 - Join Rewards Get $3 Dance Dollars On This Item! Get in on the latest trend while keeping feet warm and ready to dance with these booties by Bloch! Booties offer exceptional comfort and warmth with a cushioned insole, nylon shell, and 100% Polyester filling. Awesome to wear to dance! I got these boots because I wanted to be more comfortable while going to dance, and because everybody has them lol. They are the cheapest I've seen and they are extremely comfortable and warm. I am size 7, so I ordered the large. It is pretty big FOR ME, but my feet will grow. I highly recommend these to every dancer! Great to keep feet warm! My daughter loves theses and practically lives in them before any class or performance. They are comfortable and fit well! I need these in my life. I wear them every day to warm my feet up or to keep them warm during breaks. I have gone through 2 pairs ever. My first pair lasted me through my 4 years of college. If you wear them a lot after awhile they do start to tear, etc., but for what you're paying I think 4 years is a great amount of time. I absolutely love them, it is like wearing clouds! Love these! So cozy and warm. 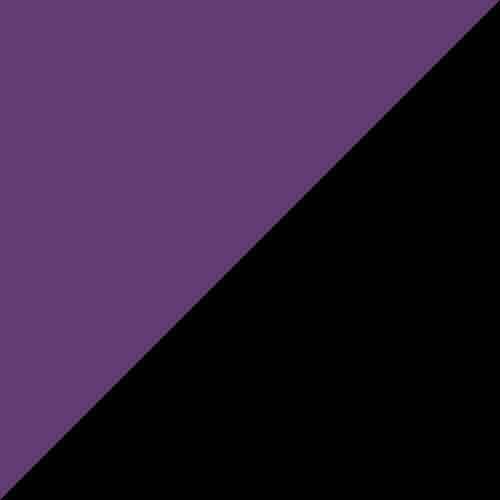 Love the deep purple color. I got these bootys in a size large so I could wear my pointe shoes under them and I'm very glad i did so !! I love the hot pink and the price and quality is really really great!! i wear these during the day because they keep your feet so nice and cozy. I also wear them to and fro my car to the dance studio so i end up walking on pavement a little bit which has resulted in a little bit of fraying but not a problem, I HIGHLY recommend these. These booties are great for warming up before class, keeping your feet warm during breaks or particularly cold days, and they're also good for protecting your pointe shoes between scenes in shows, so having the booties be a little big is a good thing. I really love these boots. My foot size is a seven so I ordered the medium. The size is a little big on me especially because they are wide and my foot is skinny , but I like it because it leaves room to put on over pointe shoes. If you do not plan on wearing them over pointe shoes and you are on the cut off between sizes then I would recommend getting the smaller size. I wear these around the house and they have a semi-sole so I will occasionally wear them to the dance studio and they are fine walking from the car to the studio. The only thing that is a little bit negative is that if you want to wear them with bare feet then they get really sweaty, so i tend to wear them with socks. Other than that I absolutely love these boots and my feet are literally always cold, so I love having them in the winter. I ordered the light pink and even though it is a light color the fabric is good and I'm not worried about them getting dirty. I usually wear 8.5 for street shoes and 6W for jazz or ballet slippers. I ordered the red large size. It's bulky for my feet but that doesn't bother me because I can wear my dance shoes in it. I really enjoy wearing them while I'm reading to prepare for my night barre routine. These booties are amazing!! I got these about 2 weeks ago and I absolutely love them! I bought mine in purple, and they are very comfortable. These booties are very warm and I wear them in between classes and at performances. These fit very well! Overall,these booties are amazing!!! 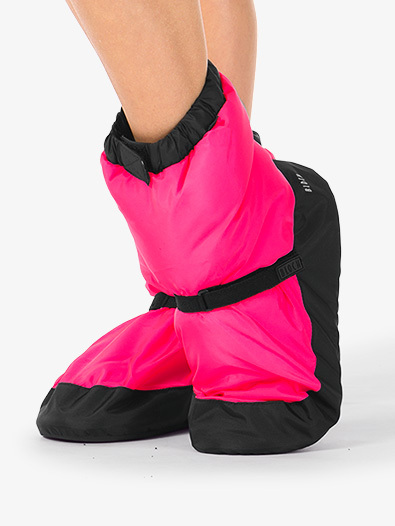 I LOVE these warm up booties! I got mine in red and a size large since I'm a street size 8, and I wanted room to wear them with my dance shoes on. There's plenty of room! 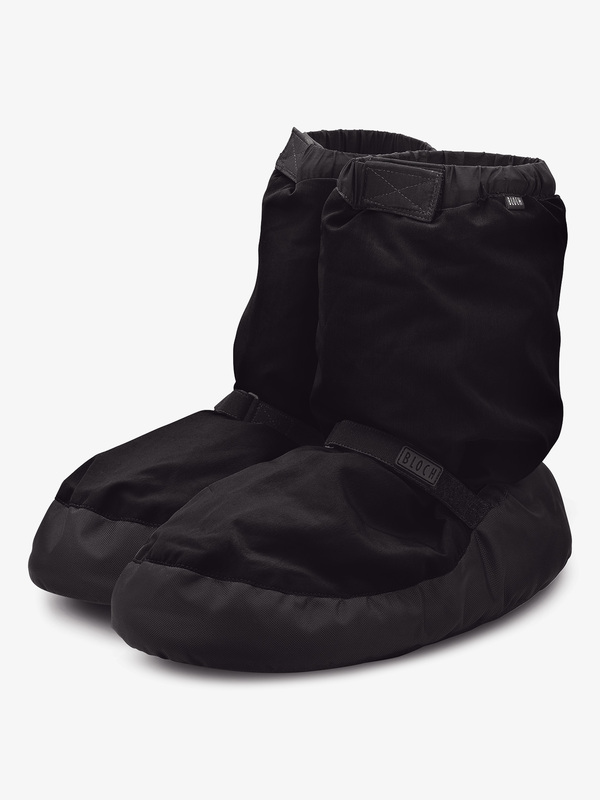 They keep your feet soooo warm and toasty in between rehearsals or when warming up in a cold studio. They're also waterproof, so you can still wear them on rainy days. This is definitely my best purchase from DDS so far. I received these booties for Christmas a few months ago, and I love them so far! 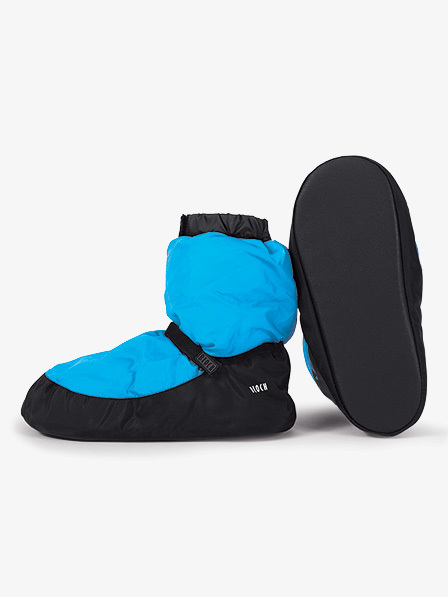 They warm up your feet very quickly and they're very comfortable and cute (I got the bright blue color). But, they do run big. I have a size 7 and I got a size medium and they are slightly too large. But it's not a big deal, and I'm actually able to use these over my pointe shoes. Overall, I would definitely recommend to any dancer! I got these for my 10 year old daughter in purple. She wears a women's 5-6 shoe depending on the brand, & also has a narrow foot. I returned the small because with her ballet shoe on it was a perfect fit. I wanted some growing room so I ordered the Medium. It gives her about 2 thumbs growing room. The top opening is also smaller than I would have expected. She LOVES them! 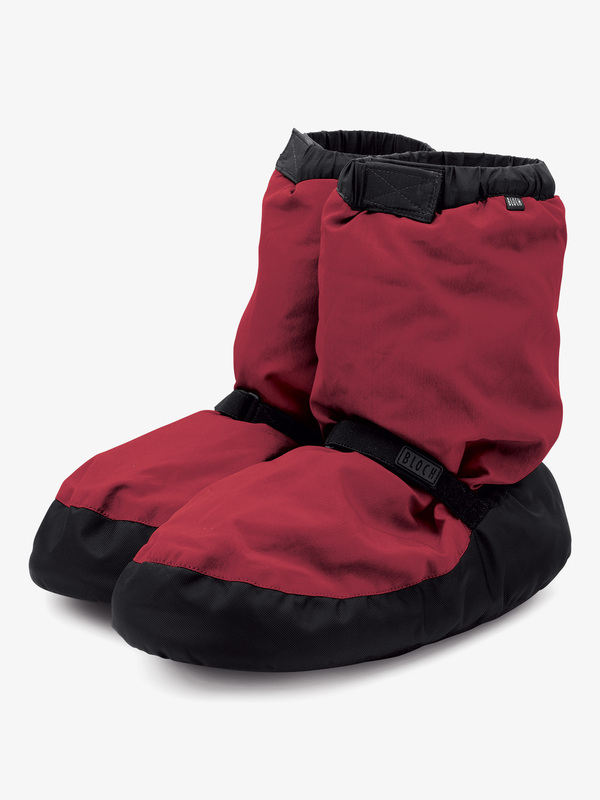 I adore these like all the reviewers before me; they are lightweight and keep my feet super warm without all the bulk other booties have. I wear a 7.5 street and have pairs in adult small and medium. The smalls fit snug like a slipper and the mediums have extra room so I wear them over my ballet flatties. I wanted to mention something for the guys. I bought a pair for a male friend, his street size is 10.5/11 and these were too small. We were so disappointed these didn't fit! I really wish Bloch made an XL for the dance dudes, they need to keep warm too! Bought these for my daughter to wear to and from dance and at competitions/conventions to keep her feet warm. A little big on her still but she loves them. I absolutely adore thes boots.I ordered them in red, and since I wear a size 10, I ordered a large.They came in, and fit almost perfectly, only a little wide and long.After a few wears, the foam or whatever smushed down a teeny bit, but not too much.The material at the bottom formed perfectly to my arches.My pointe shoes fit perfectly in them. The boots are great for breaking in shoes, as your feet heat up the pointe shoe forms to your feet.The color and quality is beautiful, even though I thought the price was a little much.These boots are a great investment, and I recommend them. I wear a size 7 -or- 7 1/2 (depending on the shoe). I ordered size small in these booties. They fit perfect and warm your feet up instantly! Really soft booties would recommend to any ballerina. I really like that you can adjust the booties tighter or looser to fit your feet perfectly. I'd say anyone between a 5 1/2 -7 1/2 could fit the small as it runs a tad large. The product size chart recommended a medium but I read reviews on how they run large so ordered one size down. Glad I did! Definitely using them during barre warm-ups. My daughter has wanted these booties for a long time and she is thrilled with them. She has barely had them off since they arrived and raves about how comfy and light they are. These are definitely going to be a dance wardrobe staple for her. Had these for a long time and took care of them so they lasted longer than others. Try not to go in rain/water with them, and i know they scuff on the ground but thats normal. In winter time this and my sansha fleece sac and jacket were key to not freezing, but there good in summer too. I would probably wear these everywhere if I could... I got these a year ago, and used them through summer intensive and class for the last 5 months. I'm not allowed to use them during regular class, so I use them backstage or before class to stay warm. I'm a 6.5 size shoe, and got a medium to fit my pointe shoes in as well. They're perfect for when I'm en pointe, but when my shoes aren't in there they're pretty big. I'd stay true to your size if you just want to use them barefoot or in flats, but definitely go up a size if you want to wear pointe shoes in them. They're the comfiest things and I'd definitely say buy them! I love these. My dancer daughter wears a size 6.5 shoe and bought these in a size large so she can wear her pointe shoes under them. she doesnt mind the large size. I tried them on and they are very comfy. I wear a size 9 and the large are a bit big on me. I think I could wear a large or a medium, but I would order a medium to wear bare feet with them. They are comfy and warm, yet light. The bottom sole is not really for outside but is a light rubber. I ordered these booties a little over 3 months ago. I love them so much! I got mine in the charcoal/black color. The fit is great and i always wear these to ballet everyday. I also can wear my pointe shoes with them. So that way I can keep my feet warm and keep my pointe shoes clean at the same time. My only complaint is that there is not very many color options, but I love them so much. My daughter used several "slipper-looking" booties and socks but they all ended up either dirty, not protecting her feet (especially the sole part) or not keeping her feet warm. These Bloch booties are comfortable, they keep her feet warm and the sole is not thin. Now they even come in many colors. My daughter wears them in the studio and in the theater when she is not performing. They are a bit pricey but they are worth it because they last a very long time. 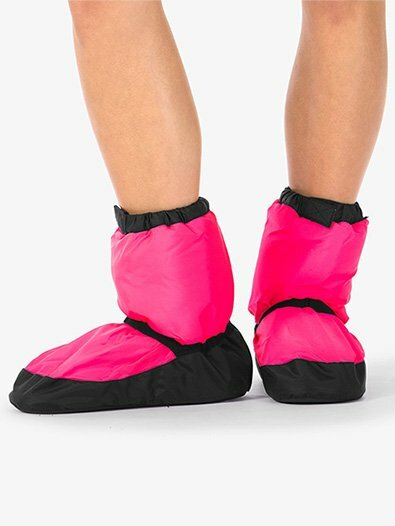 These booties are amazing,.they feel like you are walking on the moon. Lots of people from my studio have them now. It seems to be the trend! They are almost always out of stock here. If look on other sites they have them for a lower price times with more colors, and in stock! I've seen neon pink, neon orange, navy, turquoise, candy pink, and several more! oh my gosh! I got these today for my thirteenth birthday and i love them so so much! They are so soft and feel like you're walking on a cloud. My dressing room is in the basement of my studio, and they keep my feet warm when i walk upstairs. I wore them before I had to dance and my tootsies were warm and toasty. Definitely the BEST dance product you can buy. It is worth every penny. these are really comfortable and fit over my pointe shoes and also in the movie first position, miko fogarty wears them! their great and trendy! These are the best shoes to keep my feet warm at dance. Get them fast because they are very popular! They are very comfortable and durable, most of the girls at my studio wear them. Got these for the wife and then later myself. Now even my doughters and son have them. 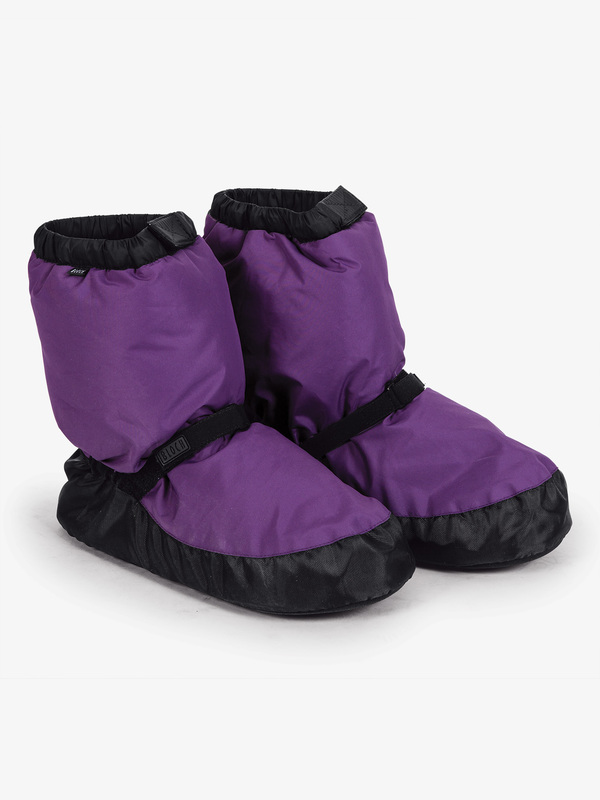 Theyre prefect for in between classes as they keep your feet from becomeing to cold and cramping up. Great for relaxing and staying warm will in the studio. Get them as soon as you can they are will worth the price. These little booties are hard to find so get them when they are in stock. My daughter wears them in the studio over her shoes. I think they run a little large but if you are wearing over shoes they will be fine. Super comfy according to my daughter. I love these bloch booties,I just got them a couple of days ago and I was so happy when they came in. At first I thought that they where to small,because of how they looked, but then I put them on and they fit like MAGIC. I just love these so much, THEY FELL LIKE WALKING ON AIR! GREAT BUY AND WORTH THE MONEY! Great shoes. I ordered them in February, and I just got them yesterday. It was a long wait but well worth it. I wear them all the time! Please get them in stock sooner so people who order them can enjoy them when they order it. these boots are fantastic! they are so comfortable that i wear them around the house and before and in between classes. We often have all day saturday and sunday rehearsals for the student company and these are absolutely perfect for those days! the only problem is that I ordered my boots in december and they arrived mid-june. I just received my boots in the mail this afternoon and I've worn them around the house most of the day and I absolutely LOVE them! They're so comfy and keep your feet extra warm when it's chilly outside. I plan on wearing them at competitions when I don't want to put on a full shoe but certainly don't want to walk around barefoot in between dances or on stage for award ceremonies, I think they'll be perfect! i have these boots in purple. there so comfortable and warm. the purple color is not as vibrant as in the picture but the color is still really pretty. These booties are the greatest of their kind that I have ever encountered! I absolutely cannot live without them in cold weather! These are the best!!!!! I not only wear them to dance, but I wear them around the house to because they are soooo comfy! They keep your feet really toasty and they get you warmed up really quick. So worth the price! Hi, thank you for your inquiry. We don't offer customization for this specific product but you can always customize it elsewhere. I would just confirm with whichever company you go to make sure the material is safe. What color is the Cloro Blue? The Blue Floro color is the bright blue color, close to turquoise. So I wear a 8 in street shoe and also have very narrow feet. I've read some reviews and most of them say they run large. I want to be able to wear these over my Pointe shoes. What size should I get? For my narrow feet? A L or a M? The manufacturer's suggested sizing for this item is as follows: S(4-6),M(6-8),L(8-10) Please note, sizing cannot be guaranteed. lm going to joffrey but I don't know if I should get these because the charcole looks guy like. These booties are unisex, so men and women can wear them. What color is the charcoal? The charcoal is a darker gray and black. There is a distinct difference between the gray and the black on the actual product. Wear size 6.5 in street shoes. On another website it says a S = 6.5-7.5 but here on DDS it says S = 4-6. I also wanna be able to wear pointe shoes with them. Please help before they go out of stock again!! Based on our size chart, I would recommend you order a size Medium, which covers a street shoe size 6-8. What size should I get?!?!! I wear a size 6-6.5 in street shoes. I don't know what size to get because a different website says S = 6.5-7.5 and DDS says S = 4-6. Based on our size chart, I would recommend that you order a size M, which covers a street shoe size 6-8. Will these ever come in other colours? 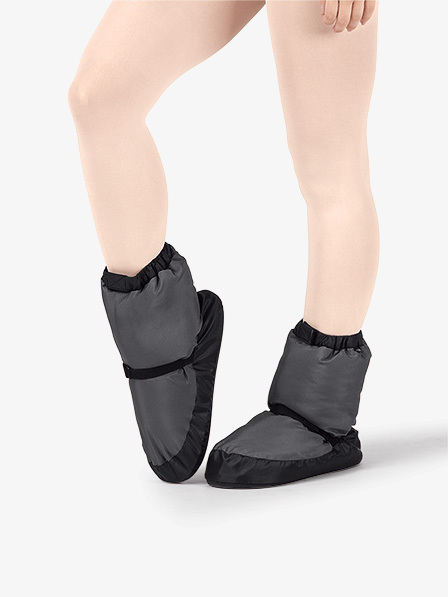 On Bloch's Australian website they have these in a baby pink with black colour, and I was wondering if these will come in a baby pink? As of right now, we will only be carrying this item in the colors currently offered. Are there any updates on when these will be back in stock? Will they be available before Christmas? As of the last update, we are expecting these in at the end of January, barring any unforeseen delays in production. Please contact customer service for further information. I would hand wash and leave this item out to dry. Can you wear these outside? I need something to wear to/at competitions and recitals and this looks good but I don't know if you can wear these outside. So I'm curious if I can wear these outside. These booties do not have a hard sole, so technically they can be worn outside and in-between classes/recitals, but I would not recommend wearing them outside for extended periods of time. when will they be in stock??! Ive been waiting since March! The vendor is having EXTREME difficulty getting these in. We are still filling backorders from November and will continue to not have these on the website until all of our backorders have been filled. These will most likely not be available for new purchases until the end of the summer. You are more than welcome to try to contact Bloch directly but even they do not have them in stock right now. Will DDS stock the blue booties? I've only seen the charcoal, purple, and red offered here. Currently Bloch is having extreme difficulties even getting in the charcoal, purple, or red. After they fill all of our backorders (that have been pending since November), we may carry the new color. However, the issue with their manufacturer is so great that even Bloch has removed this item from their website. I have waited over 4 weeks to see of these would get restocked but still have not seen anything. The vendor is having EXTREME difficulty getting these in. We are still filling backorders from November and will continue to not have these on the website until all of our backorders have been filled. This will probably not be until the end of summer. If i wear a size 9 street show should i get a M or L? The large would fit shoe size 8-10. These should be in stock within 2-4 weeks. Are these shoe sizes in men's sizes or women's? Like in the sizing below the price and those details, what size should I order if I'm street size 9 in women's? I wear an 8 1/2 to 9 street shoe in women's, what size do I need to get? And can I wear these over my point shoes? !